In 1946 after suffering overexposure to the sun while climbing the Piz Buin alpine peak, the Dr. Franz Greiter developed the brand Piz Buin and launch one of the world’s first sun protection products! The brand is born with the goal of finding the perfect balance between an effective sunscreen and a stunning and safe tan. 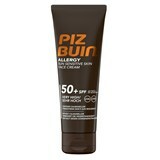 With over 65 years of market Piz Buin offers multiple sun protection solutions, with innovative and delicious formulas to ensure a beautiful and above all safe tan!